Many Chief Justices, Judges of the Supreme Court, the High Courts, the Law Ministers, the Law Commission, the Media, the Great Writers and Thinkers have all lamented over the delay in the dispensation of justice. The inordinate delay in the provision of relief amounts to the virtual denial of any relief found in number of cases. If a case of compensation in a motor car accident case is decided after ten years, when the career of the children is already spoiled for want of money, if a case of property is decided after the death of the plaintiff, what is the value or use of such a decision? Seen in the real or practical sense the courts or the government or the procedures are the real culprits for the sufferings of the plaintiff. 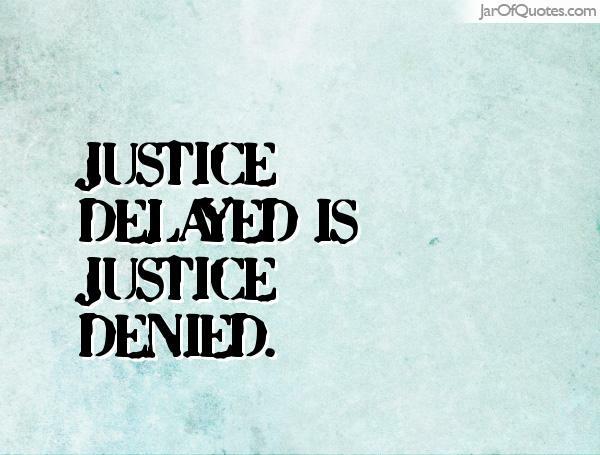 Instead of saying that Justice Delayed is Justice denied, we should say Delayed Justice is the Injustice. Millions of cases are pending in various courts, tribunals and commissions for disposal. None can predict about the minimum or maximum time for disposal of any kind of cases by the courts, whether, it is a civil case or a criminal case or a case of claims of compensation to a victim of road accidents, train accident or accident at a work place. Consumers are battling for justice for the wrongs done to them, by manufacturer or a Public Utility Service, like Electricity Board or Railways or a Hospital. There are cases of under trials that have been languishing in jail for years together, waiting for trial. Most of the under trials spend a longer time in prison than the conviction would warrant. Is it justice? “Slow progress of cases in courts and operation of the system of bail to the disadvantage of the poor and illiterate prisoners are responsible for the pathetic plight of these forgotten souls, who continue to suffer all the hardships of incarceration although their guilt is yet to be established”, said Justice Anand. Recently, the National Human Rights Commission (NHRC), expressed its grave concern over the under trial prisoners and suggested regular holding of special courts in jails and their monitoring by the Chief Justice/Senior Judges of High Courts. The Commission has found that many under trials are languishing in jails even after being granted bail because they are unable to raise sureties. Mr. Justice AS Anand had suggested that/these cases be reviewed to consider their suitability for release on personal bonds, especially in cases when they are the first offenders and the punishment is also less than two to three years. There has been no difference of opinion over the desirability of quicker dispensation of justice and dealing with the arrears of cases pending in various courts. Several tangible solutions were tried and implemented over the preceding decades to reduce or lessen the pendency in the courts. To lessen the burden of ordinary courts, different types of courts like Consumer Courts, the Administrative Tribunals, Family Courts, Lok Adalats and Fast track Courts have been set up in recent years. Though with the setting up of these courts, a number of cases have since been disposed of but still millions of cases are pending in various courts. The litany of woes caused by delay in the administration of justice is disastrous. A layman does not want to understand anything or any reason for the delay in administration of justice. He just wants and understands that he has the right to get the justice and that too within a reasonable time. When an aggrieved sorrow doesn’t get justice within a reasonable time, then all his sufferings and hardships because of such delay are like a punishment inflicted on him for no fault of his. Delayed justice is the biggest cause of prevalent corruption in the country. Many political leaders are enjoying the benefits of being ministers while a number of cases are pending against them. Are our courts not their accomplices? Why are such cases which affect the governance of the country not taken up on priority basis? Why can’t all the hurdles in finalization of such cases be removed and the lame excuses given by such politicians for delaying the cases rejected? It is unimaginable how much loss our nation is suffering from ethical and moral point of view, because of the delay in disposing of the cases. Innocent person is the worst affected and unfortunate, who has to take shelter of the courts for getting justice. Nobody seems to have remedy for his worries and frustrations. Such sufferings and hardships make him to conclude that Justice Delayed is Justice Denied.